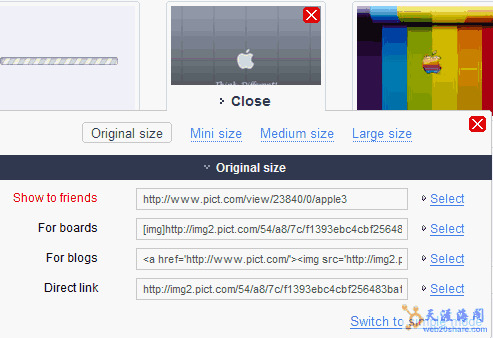 Pict is an easy-to-use one-click free image hosting service. Pict is a picture hosting service which supports JPG, GIF and PNG image file types.The interface of the site is quite simple, you can upload the image by click “Click here to upload” or the “Upload Image” to upload. When you uploaded the picture , you can share photo in Simple Mode or Advanced Mode(which has four image type to choose),you can share the photos to your friends by email, post your image on boards and forums; post uploaded images on websites or blog or share the direct link. Link and share images on forums, blogs, social networks, etc.